“Romancing the Rose” Gold Framed Archival Digital Fine Art strikingly matches the original Pastel Painting I created. Richly framed with a Gold pebble textured frame with a black edge brings the whole composition complete. Combining the different details around the center Red Rose symbolizes protecting “Love”. Surrounding the Love Rose with colorful, happy colors, flowers, butterflies, leaves, ladybug and berries brings loving beautiful thoughts our world’s nature translating to the love(s) of your life. 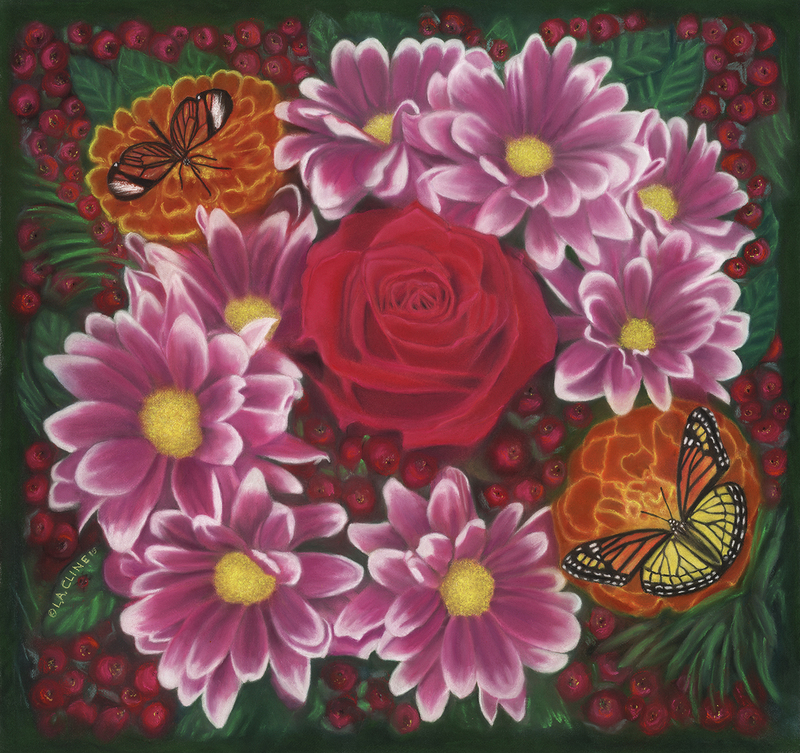 “Romancing the Rose” brings close up and personal the happiness of the beautiful things we can strive for in our lives. Starting a complicated painting such as this I create a details pencil sketch to scale. In fact each painting has a pencil sketch to scale. I call this sketch somewhat of a blueprint or guide. There are so many layers of pastel that had to be slowly layered when creating “Romancing the Rose”. Using white pastel against darker pastel requires a delicate and timely layering technique. Pastel medium is dusty. It is a dry application of color. Passtel sticks hard or soft leaving a dusty residue. The Pastel sticks are pure color mixed with a dry binder which virtually leaves you with pure color to work with. Pastel is a natural, beautiful medium to paint with for real life painting such as “Romancing the Rose”. 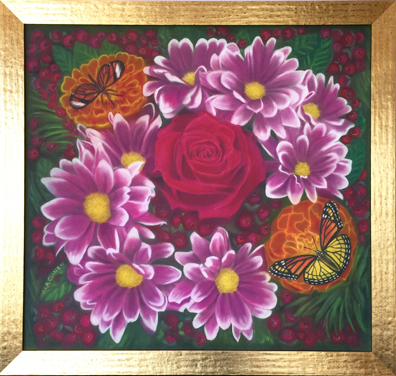 “Romancing the Rose”, Gold Framed takes the beauty of the original and gives you a smaller version that captures the same incredible colors and details surrounded with a gold frame. Still a show stopper. This strikingly beautiful work of art is filled with the organic beauty of our world.